The more intriguing mystery of “The Public Enemy” is the department store used in the early part of the film. Recall that our young ruffians run through an unidentified department store, committing all sorts of mischief and aggravated mopery. One of the most prominent elements of the sequence is a set of three-story escalators that provide our incorrigible lads with a means of escaping the law. Women in c. 1900 dresses ride a set of escalators. Our mystery building also has elevators. At the top of the escalators, we find elevators. A police officer gets off the elevator. Our young miscreants make their escape! A reverse angle shows more of the store. It seems logical to infer that Warners used a department store that would fit with the 1909 period in filming this sequence in 1931. The Fifth Street Store (5th and Broadway) 1921. June 22, 1924: Apparently the possibilities are limited to Hamburger’s/May Co. and the Broadway. 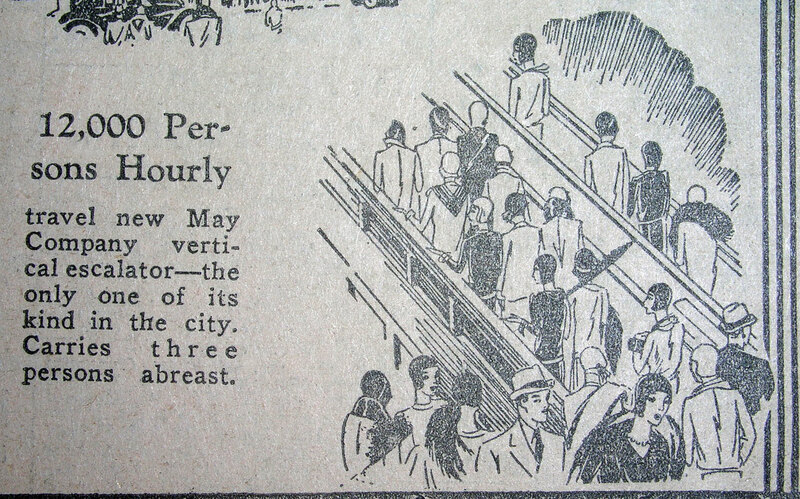 July 2, 1929: There are 30 escalators in Los Angeles. Is any member of the Brain Trust an expert on department store interiors? This entry was posted in Architecture, Downtown, Fashion, Film, Hollywood and tagged #Department Stores, #Escalators, #Public Enemy. Bookmark the permalink. Let me check the photo files today, and I’ll also check for escalators on proquest. I tried searching the USC and LAPL databases for escalators last week, but didn’t find anything. @Mary: I didn’t have any luck finding interiors there either. There is a collector who has lots of postcards of Hamburger’s interiors and the escalator looks nothing like what’s in the movie. I don’t want to use the image without permission, however. Here’s a collection of postcards showing the interior of Hamburger’s. Anyone else notice the WB on the light above the officer’s head? Can we rule out those shots as being filmed on a soundstage? @Cat: I’m not sure that’s a WB. The expense of building this as a set would have been beyond the budget of “Public Enemy.” And it’s lit like a location rather than a sound stage. As Gary pointed out, building a working escalator is very expensive. No no no, just that angle, since the light above his head and the lack of floor indicator doesn’t match other shots of the elevator doors. I enlarged the globe and couldn’t make out the second letter. I know it’s not WB, but it could be WM, WH, WN or WW. Maybe the LA department store used in the film had another fictitious name? Without seeing the film, I know that it was not set in LA. @Lee: It could just be a design etched into the glass that appears to be a W.
Well, I am not an expert on escalators, but I am pretty sure that it’s The May Co. I do recall somewhere in the back of my mind that part of the movie was shot there. Walkers Department Store? There’s only one interior shot in the library collection, but the light fixtures are very similar. They’re as close as I can find, so far. I looked through our photo/clipping files and nothing. The only photo of the boys is an exterior shot, and no interiors of the department store. Can anyone blow up the sign showing the elevator going up and down to see if it includes a name? @Mary: All I can do is a screen grab on my computer… Tricky to enlarge very much. The Walkers building is still up. Anyone want to visit? Thanks for this wonderful blog- I look forward to it every day. A special ‘shout out’ to Mary Mallory as I so enjoy her contributions to this blog! @Craig: Looks like a match. Great detective work! Thank you so much for your kind comments, very much appreciated. I did a USC library search and found an interior May Dept. Store shot (the lights and pillars are a dead giveaway) showing an entrance (draped in the movie) with a large exit sign reading “Broadway,” and a view of the Rialto theater across the street. The Rialto was at 812 S, Broadway across from…you guessed it. Joining the conversation late, but, here http://farm8.staticflickr.com/7048/6888410055_1b77496f47_o.jpg is a rendering of the escalators in question, note the wide one across from the narrower version. As this was “new” in the 1930 newspaper ad, a bit anachronistic for 1909! But I forgive them.